NORTH ANDOVER, Mass. 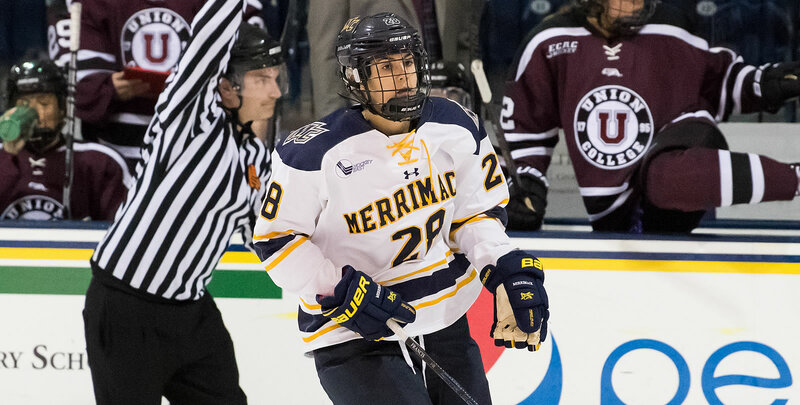 - The Merrimack College women's ice hockey program saw sophomore Megan Fergusson net her second game-winning goal of the season Saturday afternoon, as the Warriors completed the season sweep against Maine with a final of 3-1. Merrimack's sixth program win against the Black Bears serves as its second series sweep of the season, allowing just two goals in the three games played. The Warriors needed senior Samantha Ridgewell to step up early, who made nine saves in the opening 10 minutes to keep the game level. It wasn't until senior Paige Voight picked up her 10th goal of the season when the Warriors could breathe a little. Maine fought back, and picked up its first goal against Merrimack since November 2 when Lydia Murray's equalizer sent the contest into the final 20 minutes tied. Sophomore Megan Fergusson picked up the second Warrior goal of the game at the midway point in the third period, netting her second game-winner of the season. Ridgewell gave up just one goal but was tested throughout the game; her 31 saves helped the team improve to a program-high 14 wins. Goal #1 (1-0 MC) - The Warriors were outshot 8-1 through the first seven minutes of play but managed to find the back of the net thanks to a hustle play from the second line. Sophomore Megan Fergusson outworked a Black Bear along the boards and fed a pass to Paige Voight; the senior rifled a shot over the shoulder of Maine netminder Carly Jackson for the game's first tally. Goal #2 (1-1) - After throwing on over 20 shots through the first half of the game, the Black Bears went tick-tack-tow during a breakout, with Lydia Murray finishing off the last pass with a no-doubter. Goal #3 (2-1 MC) - The Warriors battled back through the second period equalizer, and in the third, got a big-time goal from sophomore Megan Fergusson. Junior Chloe Cook and senior Paige Sorensen picked up helpers, and they found Fergusson to make it 2-1. Goal #4 (3-1 MC) - For good measure junior Mikyla Grant-Mentis was able to fire home an empty-netter to ice the score at 3-1. - The Warriors have completed its second series sweep in program history, allowing just two goals against Maine in three games. - Senior Katelyn Rae and Grant-Mentis have combined for 47 points this season. The Warriors square off against Boston University for its last home-and-home series of the month; puck drop inside Agganis Arena in Boston is set for 7 p.m.